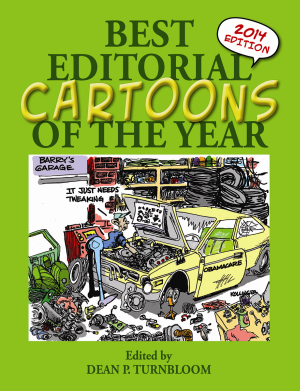 In this forty-second annual edition of the acclaimed series, more than four hundred clever and provocative editorial cartoons spotlight and satirize the major events of 2013. With entries from both liberal and conservative viewpoints, no subject is off limits. The nation’s best cartoonists target politics, government, the economy, pop culture, and sports. From the explosion of the Syrian civil war to the Boston Marathon bombing, the Affordable Care Act to the government’s partial shutdown and the uncovering of the US government’s mass surveillance program, this collection of editorial cartoons satirizes these issues and everything in between while showcasing the wit and creativity of America’s best humorists. Long an admirer of the form, Dean P. Turnbloom has had his cartoons published by outlets such as USA Today and CNN.com. 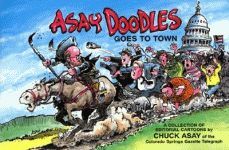 While this book does not contain any of his own artwork, Turnbloom anthologizes the top editorial cartooning awards of the year along with the year’s winners. He is a naval civilian, working with the navy to install shipboard network systems on fleet ships. He and his wife, Nanette, have three children: Lucas, Bethany, and Jacob. They live in San Diego, California. 402 illus. Index 42nd ed.